Vitiligo is a loss of the pigment producing cells of the skin, either because they die or they quit working entirely. It can be caused by an autoimmune problem; that’s usually what we think of it is. There are viral triggers and there are family related triggers as well because we see it run in families sometimes. There are two kinds of vitiligo. 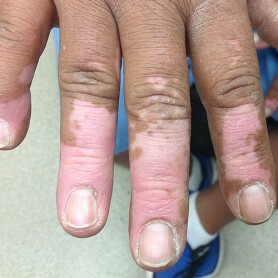 There’s segmental vitiligo which is uncommon. It affects part of the skin that’s innervated by spinal nerve route. And then there’s non-segmental vitiligo, which means it’s not part of a nerve route area of the skin and can affect mainly the hands, unfortunately the private areas of the body. It can really be anywhere on the skin. We often see it start on the hands or start in the private area of the bodies. Some vitiligo stops itself; the autoimmune reaction burns out. Some vitiligo continues until large parts of the body are encompassed by vitiligo. The face is also common, which is tragic. Unfortunately, there is no cure for vitiligo at this time. The best treatment is to catch it early. It can be diagnosed easily by a biopsy. 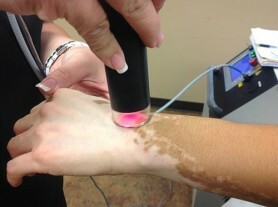 It can be diagnosed easily by an old tool called a woods lamp, which is really a black light, and it causes the vitiligo to stand out in a bluish white color and will also show us areas of the skin under the black light that are already depigmenting that are not visible to the naked eye. Treatment is difficult, and if we catch it early it works better. Treatment includes some steroid creams, some creams called calcineurin inhibitors that break up the autoimmune cycle and try to stop it. Works best when we also do it in combination with ultraviolet therapies especially the Excimer B laser, or the ultra-narrow-band UVB light. Vitiligo is a non-contagious skin condition that affects 1-2% of the population, which is approximately 2-4 million people in the United States! Vitiligo is a patterned loss of melanin pigment resulting from the destruction of melanocytes. Melanin pigment defines color in the hair and skin and is produced by cells called melanocytes. If melanocytes die or can no longer produce melanin, the skin becomes lighter or completely white.It is rare for your skin pigmentation to return on its own without the help of a treatment. 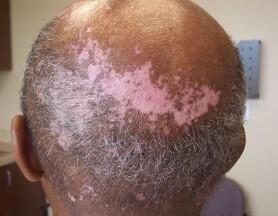 However, if your skin does return to its natural color, you many still have vitiligo. 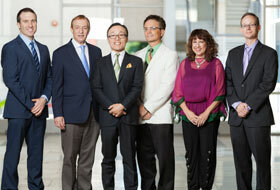 The loss of pigmentation and how the pigmentation takes its course differs between each person. There is no way to detect the severity of how much pigment a person will lose after diagnosis. Many people try disguising vitiligo with makeup or self-tanning compounds to make their pigmentation appear less noticeable. While none of these methods help cure the disease, they can improve the visibility greatly. If you’re tired of simply covering up your skin pigmentation, make an appointment with us and we can work with you to find a solution. Below is a list of vitiligo treatments that we may recommend based on your symptoms and needs. The XTRAC® Excimer laser is a targeted laser that we use to deliver a focused beam of UVB light, through a unique delivery system, and targets the hypopigmentated patch of skin. While avoiding harm to the surrounding healthy tissue, we are able to successfully bring pigment back to areas of the skin suffering from discoloration. Phototherapy, or UV light, is a successful way to help bring back pigmentation to the skin. Clinical studies have shown that UVB light is the preferential wavelength for stimulating melanocytes to initiate the repigmentation response in vitiligo patches, bringing the color back to your skin.